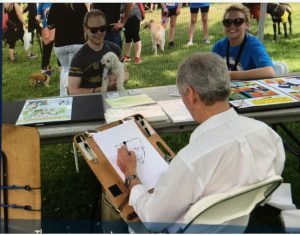 I was privileged to be a part of the Humane Society’s fundraiser called the Furry Skurry at Eastwood Lake near Dayton recently… Lots of fun people and their amazing animals, mostly beautiful dogs. 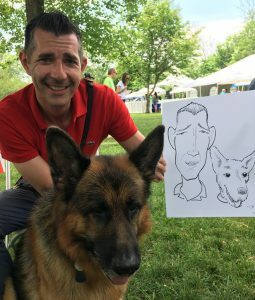 One of the most memorable people that day was this young man and this fabulous German Shepherd, his best friend I believe. He said the dog pretty much saved his life after he returned from serving with the US military in one of the Mideast conflicts and found himself struggling with crushing levels of Post Traumatic Stress Disorder (PTSD). He indicated the paranoia was intense, often looking to all sides for hostile action and frequently dealing with panic attacks. Then he gained the company of the German Shepherd — and what a blessing. The dog helped him calm down and begin edging back toward a normal life, he said. Now he does public speaking on behalf of The Battle Buddy Foundation, which supports veterans in various difficult circumstances. My apologies for not having his name here. The organization sounds terrific and we of course wish them well. 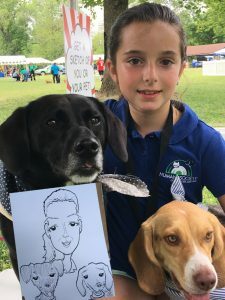 Also shown here is a young beauty and her wonderful dogs, out for a fun romp in the park for a good cause. All good, eh? ← Party Ideas — LOTS!